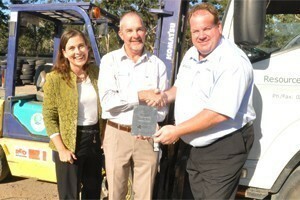 A joint initiative between a NSW local council and a Not for Profit waste reduction and recycling organisation has won a national innovation award for integrating social responsibility into waste contracts. Above: The Green Project Managers Lisa Strudwick (left), Krysten Banks (centre), Resource Recovery Manager, Craig Rees (4th from right) and Great Lakes Council’s Manager of Waste, Health and Regulatory Services, John Cavanagh along with Resource Recovery Staff. 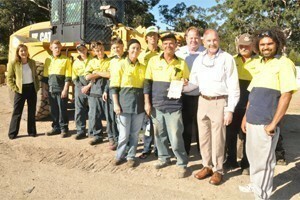 The partnership between the Great Lakes Council and Resource Recovery – a Not for Profit landfill contractor – won the award for Local Government Innovation in Waste 2011, for their work providing training and employment to the long term unemployed and participants from Juvenile Justice and Probation and Parole. Resource Recovery operates council landfills, and a waste management centre on the mid north coast of NSW, providing training and coaching in landfill operations including plant operations, computer and weighbridge operations, customer service, retail sales and recycling. The Green initiative includes a shopfront incubator for new green enterprises along with construction of waterwise, permaculture, native and children’s gardens and structures. The Project will also provide environmental (sustainability) education in waste avoidance, re-use, water and energy use minimisation. John Cavanagh, the Council’s Manager of Waste, Health and Regulatory Services, says in the past many councils have considered that these initiatives come with a risk too high to consider. Cavanagh says it has been proven that by having a contractor whose key objectives include training and rehabilitation of the socially disadvantaged and long term unemployed and a Council willing to work with that, it is achievable and exceptionally rewarding. He says it is the Council’s experience that neither contract performance or Occupational Health and Safety are compromised, and they are pleased with the positive community outcomes that can be achieved. Great Lakes Mayor Cr Jan McWIlliams says the award is a well deserved recognition of the quality work being undertaken by Council and Resource Recovery that will result in environmental benefits, waste minimisation and positive social outcomes for the community. In addition to education and training for the public, other ideas being considered as part of the initiative are establishing a community cafe, grey water systems, bamboo farming, alternative power generation, eco-tours, facilities for sports and hobbies, e-waste facility, chicken tractor, driver-training and construction of public access pathways connecting to Darawank Wetlands, the beach and Tuncurry Skate Park.